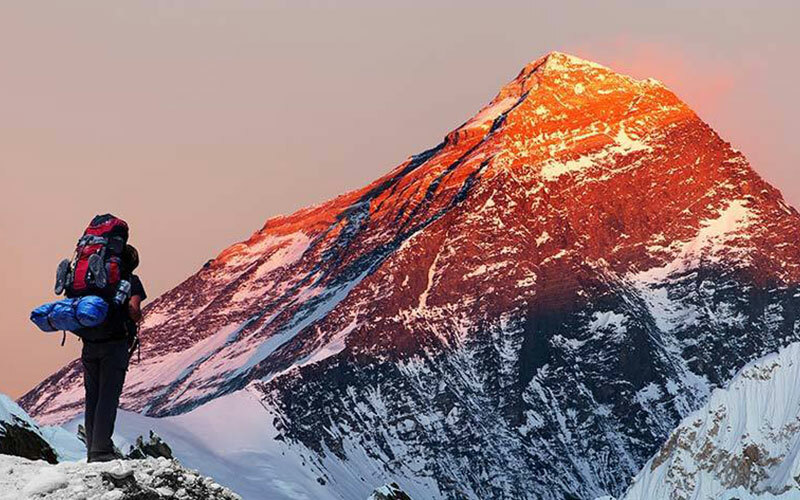 On Everest Base Camp Trek – 15 days we can experience outstanding view of the mountains, beautiful glimpses and panorama’s. The trip begins with the arrival in the capital city of Nepal i.e. Kathmandu, from there you will take a flight to Lukla then start your trek towards Phakding which is at an Altitude of 2652 m with a distance of 144 kms. 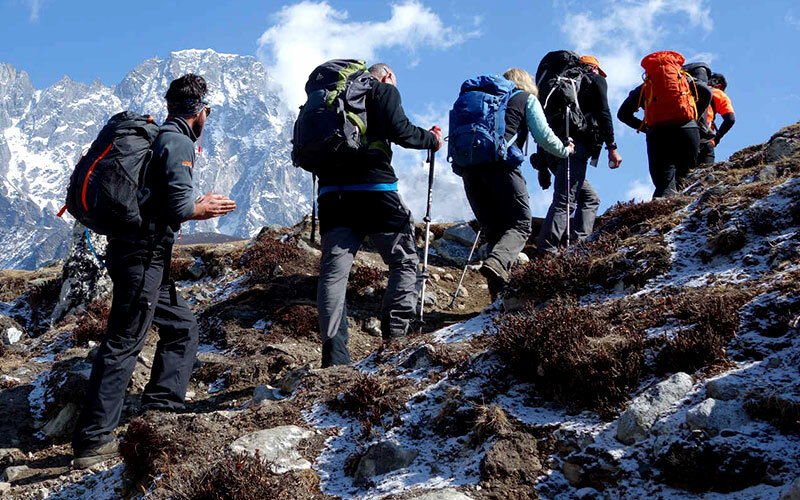 As you cover ample distances up towards the Everest there are a lot of changes in the altitude and it will be important to take a day for acclimatisation to fully enjoy your trek towards the Everest. The hike in the trek will continue till Kala Patthar then from their it will start descending Pheriche, Namche Bazaar, Lukla, finally departure from Kathmandu. On arrival Kathmandu assistance at Kathmandu Airport, you will get introduced to the accompanying guide and will also be briefed about the trek. The guide will take care that all your equipments are in place and will also recommend you if anymore required to purchased or rented. Morning breakfast at hotel then proceed trekking to Namche Bazaar which is at an altitude level of 3440m. The walk will include crossing of many bridges and a walk along the River Dudh Kosi to reach Namche Bazaar. If wants you can have lunch at Monjo which is the last point to have food before reaching Namche. The route between Monjo and Namche is very steep with amidst thick green forest. You can have a view of Everest and Lhotse once you reach Namche, though it will be not so clear. The trek will be for around 5 to 6 hours with moderate difficulty level and at certain portion very strenuous after Monjo. Overnight stay at Tea House or Mountain Lodge, Namche Bazaar. This is the day free for Acclimatization; here you can rest today at Namche Bazaar. Namche once the capital of Khumbu is situated on a slope of an arch shaped mountain, which overshadows the sights of glorious mountain peaks throughout the valley, day and night. It is a place where you can get everything you wish to, you can find many Coffee shops,Bars, Restaurant and many more things. Also one can give a visit to Namche Museum which is a 20 minutes trek and gives a clear view of Everest and Lhotse. There is Namche Bazaar (Market) and Monastery as well. Overnight stay at Namche. Morning move towards Tengboche for trek of about 5 hours with moderate difficulty level. Tengboche is a small valley at an altitude level of 3867m in Khumjung in the Khumbu region. It is one of the most beautiful places of the entire trekking route with soaring Himalayan Mountains in the background. The population of the town is no more than 100 people. The Tengboche monastery is very famous and beautiful. Today we will start our trek towards the Pangboche village from where you can have a view of heavenly beauty Mount Ama Dablam. This village lies at an altitude of 4000m is a permanently occupied village at the highest elevation. You can have lunch at Pangboche with a beautiful view of Mount Ama Dablam . Later continue your trek towards Pheriche and Imja Valley, on the way you can see the Lobuche River. The trek through Imja Valley will be moderate and easy to cross. The valley ahead begins to open as we come across the River Lobuche, we descend into the valley and here we continue the trek to Dingboche. The journey will be for about 6 to 7 hours, it will be moderate for most part but you will come across 2 steep inclines. Overnight stay at Dingboche. The day before was a very rough day, so today I was pleased to wake up feeling much better than the day before. The day is free for acclimatization at Dingboche. A small hike can be taken to get a view of worlds three top mountain peaks, Mount Lhotse, Mount Makalu and Mount Cho Yu. Besides these, you can see more views of many mountain ranges. In the village of Dingboche, you pass through many small shops selling canned goods (olives, sardines, pasta, etc.). Overnight stay at Dingboche. Morning breakfast at hotel then start for your shortest trek of the trip to Dughal , which is at an altitude level of 4,620 m. In the start the trek would be a bit steep later it will get more or less flat. On your day down while crossing over Pheriche, you can have amazing views. Also you can have a magnificent view of Mount Pumori (7,138m) and a glacial lake. We will come across the Dudkoshi River just nefore our Tea House, and the source of this river is just 1 km away from this place. On arrival check in the Tea House, overnight stay at Dughla. 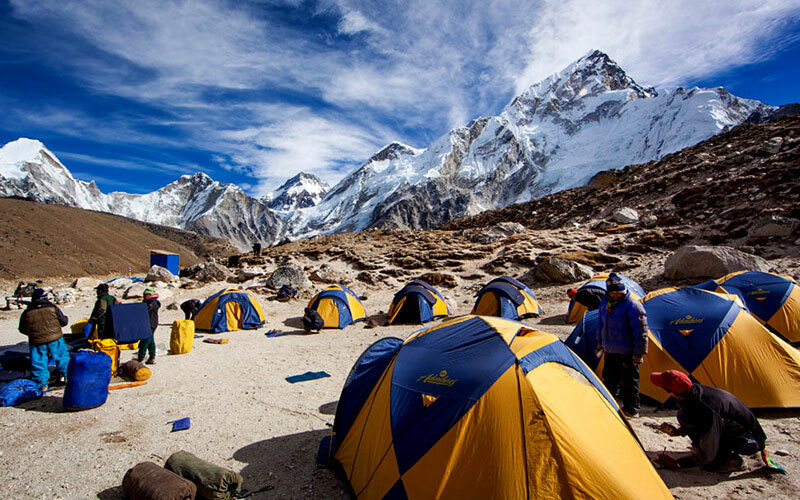 Morning start your trek towards Lobuche which is situated in the Khumbu Region of Nepal. Initial part of the trek will be tough as we will hike to Dughla / Thukla Pass and the oxygen level gets lower at this place. It is a short and steep hike from there. We can spend some time at the pass and then proceed to Lobuche. Overnight in a Tea House/Mountain Lodge in Lobuche. The difficulty level moving ahead leaving Lobuche towards Gorakshep (5170m) will increase. From Gorakshep continue walking through the sides of Khumbu glacier to Everest Base Camp (5364m), from here you will be able to see Everest but can’t get the full view, only snowfall at Khumbu will be clearly visible. After spending some time at Everest Base Camp back to Gorakshep. This part of the trek will make you feel in heaven amidst the glaciers and see the gigantic mountain up-close. You can have a clear view of the Everest Peak tomorrow from Kala Patthar. Overnight stay in Gorakshep. The trek to Kala Patthar will be the most difficult one. The ascent is demanding but the climber gets the most magnificent and the most accessible view of the Mount Everest. It will take around to 2-3 hours to reach Kala Patthar from Gorakshep. After reaching Kala Patthar the remaining treks starts descending and becomes very simple, though you have to be careful about the decline. Another 3 hours declining you will reach Lobuche (4940m). Total time period of the trek will be around 7 hours max with only one steep incline and rest simple and easy trek. Based on the group’s mutual decision you can trek down to Pheriche the end of the wide Himalayan Valley. Today we will proceed to the Airport and catch our flight to Kathmandu and enjoy the valley views throughout the 35 minutes flying time. This is a complete leisure day and overnight stay at hotel or guest house. Visa and permit fee charges. Expert tour guides for sightseeing tours. 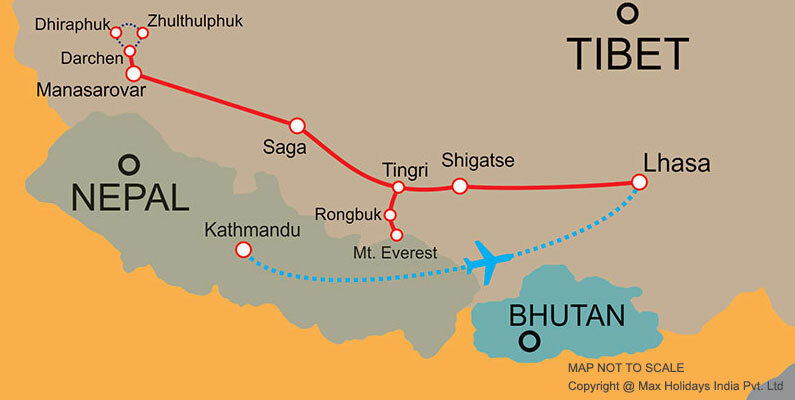 Domestic flights (Kathmandu to Lukla and return) are included. Please carry valid travel insurance. "Traveling to Himalayas and getting close to one of the highest mountain peaks in the world was my long awaited dream and I had been planning to do this trip quite from so long. Hailed from Australia sometimes it seemed to me that I would not be able to make it due to expensive air tickets for Nepal but I knew that one day it will come true. Finally, one of my friend agreed to accompany me and then we started searching for a trusted travel agency who can take care of our arrangements. I was recommended by one of my friend Jerry who availed the service of Max Holidays. Earlier I doubted whether they even have office in Delhi as the company head office is in India but trusting my friends words I approached them and I would say it was not a bad decision as they have a office and even the entire team is really well experienced and listened to our each and every details in order to prepare the trip according to our requirement. The trip gives us very little scope to make major changes but still wherever it was possible they did it keeping all precautions and safety measures so that we can return back safely. From starting till the end of the trip, all arrangements were well take care by the group handling staff and there were some minor things but I did not mind as it was beyond their control and that time too, they cooperated us very well with us.. I can blindly recommend you guys to anyone who wish to do this trip and I am really hoping to travel Bhutan next year and for that I will be in touch base with you shortly." "Hey Amit, we returned back to home after a fabulous trip organized by you and we are really happy with the services and other arrangements you made for me and my wife who are adventure lover and was looking for a Everest base camp trek. I would say that the entire team during the journey was very cooperative and helpful and it was a great meeting you in Delhi too. Starting the trip from Rajasthan and then going to Nepal was what we decided. Thanks for arranging such a long trip for us and we are really happy with our overall experience." "We were a group of 06 people from Germany and undertook Everest base camp trip through Max Holidays. We landed in Kathmandu on 15 April and spent first two nights in Kathmandu. Frankly speaking, I won’t suggest anyone to waste their time in Kathmandu as there is nothing much too see and it is a typical crowded metro city. It was our decision to stay an extra night in Kathmandu as we wanted to explore the city. After 02 days, we took a flight from Kathmandu to Lukla and the flight itself was breathtaking, beautiful view of the Himalayas. Trek was started from Day 03 towards Kalapattar which is at an altitude of 5645 meters (the highest point in our trip).. I must say that it seems easy but people with positive frame of mind would be able to complete the trek as it was very challenging trek. My friend got sick and the team on the spot had medicines for high altitude sickness. Sometimes, we had to trek for 07 hour and on such a high altitude, it tested our physical fitness and mental preparation. Overall, it was a fantastic experience and I truly enjoyed it. I would be happy to share further inputs for anyone interested"